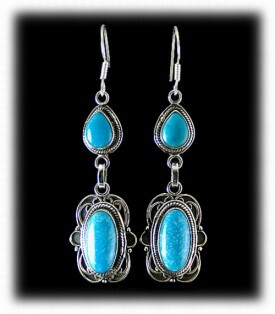 Turquoise Dangle Earrings are very much in vogue and have been for many years. 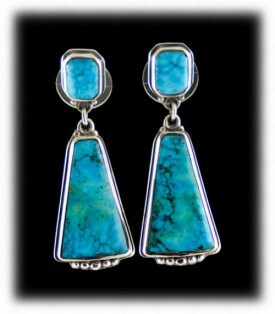 Turquoise Earrings bring out the brilliance in a woman and Turquoise Dangle Earrings make her shine! Bold is beautiful and it has been said over and over again Turquoise Earrings make a woman look vibrant, cheerful and full of life! 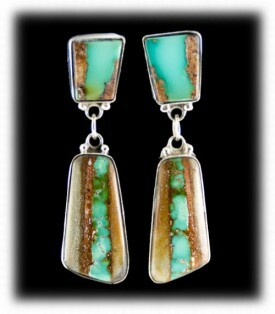 This is a great description of a great pair of Turquoise dangle earrings. Turquoise Dangle Earrings and Turquoise Chandelier Earrings come in a wide variety of vivid Blue and Green hues, when accompanied by Sterling Silver and even other gemstones, they are dynamite! Turquoise Dangle Earrings are for every woman and no woman should be without several pair of Turquoise Dangle Earrings in their collection. Durango Silver Company strives to have a great supply of Turquoise Dangle Earrings and in constantly on the hunt for new and innovative styles to make our clients excited. Below are some examples of Turquoise Dangle Earrings and a few Turquoise Chandelier Earrings, we invite you to go to our Turquoise Earring section on our site to see more. 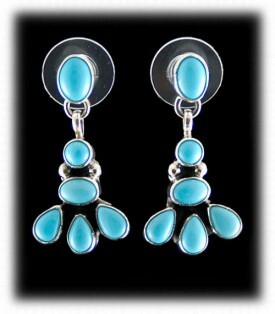 Make certain you return often to see the new Turquoise Earrings that are continuously added to our site. Below are a few examples of Turquoise Dangle Earrings with descriptions of them for your education, we have many other Turquoise Earring educational pages that can be found from our Turquoise Earrings page. Above and to the left is a pair of Blue Turquoise Dangle Earrings that were Navajo handcrafted in Sterling Silver with Sleeping Beauty Turquoise from Arizona. Navajo Turquoise Jewelry is known for having Silver filigree work that surround and meant to enhance the Turquoise Gemstones. Arizona is known for its sky blue Turquoise and Sleeping Beauty is known for its clear blue Turquoise with little or no matrix. 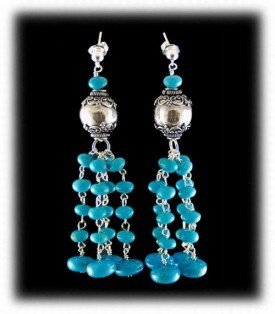 This is a beautiful pair of Sleeping Beauty Turquoise Dangle Earrings and very attractive when worn. To the right is a pair of Green Turquoise Dangle Earrings set in Sterling Silver with Broken Arrow Turquoise from Nevada. The Nevada Green Turquoise Stones are bezel set in Silver and hang from a fluted and domed Sterling Silver button or concho. 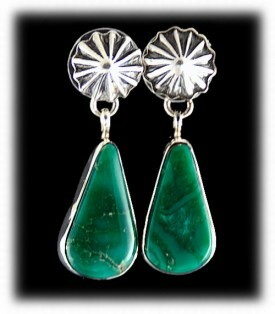 This style of Turquoise Dangle Earrings are easy to wear and you should know that green matches about every other color. Bezel set Earrings are light weight which also make this type of Earrings easy to wear for long periods of time. Above and to the left are a pair of Royston Ribbon Turquoise Dangle Earrings, Ribbon Turquoise is unique as the Turquoise is cut to show the vein of Turquoise as it runs through the natural host rock. This pair of Turquoise Dangle Earrings are exciting as the Turquoise Stones are festinating and very attractive to the eye, a super eye catching pair of handcrafted Turquoise Dangle Earrings by Durango Silver Company, made in the USA! To the right is a pair of Blue Turquoise Dangle Earrings with Lookout Mountain Turquoise. This Turquoise dangle earring style was made by John Hartman of Durango Silver Company and is a favourite in our line of production Jewelry, they are lightweight and flashy fashion Earrings that women really like. The backs of the Earrings are open to keep the weight down. 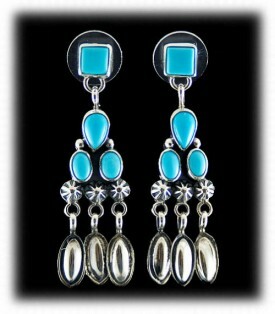 These are really neat examples of American Turquoise Inlay Dangle Earrings. The pair of Turquoise Dangle Earrings on the upper left are Navajo Handcrafted in Sterling Silver with Sleeping Beauty Turquoise. This type of Turquoise dangle earring is considered Navajo cluster work, this is where they cluster several stones in a design, similar to the way the Zuni Indians cluster their Needlepoint and Petit Point Turquoise Jewelry. Sleeping Beauty Turquoise is really a great choice in Turquoise as it stands out and attracts the eyes of others clear across a room! It is truly dynamic Turquoise as well as being the most popular Turquoise in the world right now. Outstanding Blue American Turquoise and Silver Bead Earrings by Dillon and Nattarika Hartman. These wonderful Dangle Turquoise Earrings feature a Sterling Silver and Sleeping Beauty Turquoise medallion, which is hung from Thai silver and Blue Gem Turquoise beads. These American Turquoise Beads and Thai Silver (.925) beads are set on Sterling Silver wire, which is hung on a Sterling Silver French wire. The Thai Silver beads were handmade in a Hill Tribe Village in Northern Thailand. The blue Turquoise roundel beads were cut form American Turquoise mined in Nevada, USA. The medallions were made by Dillon Hartman from Sterling Silver and inlaid with natural Sleeping Beauty Turquoise. These bead Turquoise dangle earrings would be a perfect addition or start to any Turquoise Jewelry or Bead Jewelry collection. Sleeping Beauty Turquoise Chandelier Earrings by Geneve Apachito. These earrings feature four sky blue natural Sleeping Beauty Turquoise cabochons. The Turquoise dangle earrings are composed of a three stone cluster of two ovals and a raindrop cabochon, which have three repose silver marquees dangling from them. These Turquoise dangle earrings are hung from a single square stone stud. Geneve is a Navajo Native American Indian. To the right is a pair of Chandelier lime green Tibetan Turquoise Nugget Dangle Earrings by Nattarika Hartman. 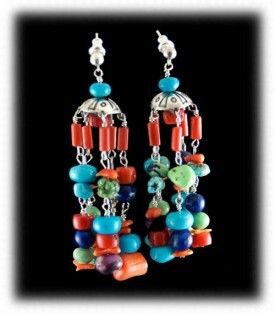 These great chandelier fashion earrings feature multiple tiny lime green Tibetan Turquoise nugget beads. These great beads are set on a chain and each move freely giving the earrings a great movement and a light, super comfortable feel. These Turquoise dangle earrings are hung on sterling silver French wires. These Fashion Turquoise Bead Earrings were handcrafted in Durango, Colorado USA. To the upper left is a pair of contemporary fashion Chandelier Bead Earrings by Nattarika Hartman. These beautiful Fashion Bead Turquoise Dangle Earrings have many different shapes and color's of gemstone beads on Sterling Silver wire. These Turquoise dangle earrings feature Blue Gem American Turquoise, Mediterranean Coral, Lapis Lazuli, Sugilite, Tortoise Turquoise, and Mojave Green beads. To the right is a pair of Turquoise dangle earrings or Chandelier Turquoise Earrings that are awesome when worn. They were made by Nattarika Hartman with Sleeping Beauty Turquoise, a Sterling Silver handcrafted filigree bead and were created in Silver. These Turquoise dangle earrings stand out from across the room when worn do to this ultra bright sky blue colored Turquoise. You will love the weight of Nattarika's Turquoise Beaded Earrings, comfortable all day long. 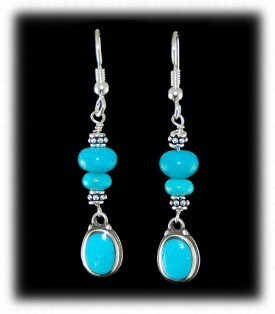 We hope you have gained some useful knowledge from our Turquoise Dangle Earrings educational presentation page. We invite you to learn more about Silver Jewelry, Indian Jewelry and Turquoise Jewelry by following the links in our Learning Center which has many other informational pages that we have written on topics related to Southwestern Silver Jewelry. In addition, we would like to invite you to join our E-Mail Newsletter - about once every other month we send out a Newsletter to inform our members of what's happening with Durango Silver Company, new products, specials for our members and more. We also have a monthly drawing from our members to Giveaway free Turquoise Jewelry from our company. Please take a moment to become one of our friends and future winners in our giveaway by signing in below. Thank you for reading about Turquoise dangle earrings we hope you have learned something that will help you in your next purchase of Turquoise dangle earrings.